ShoutBloger: Samsung Electronics introduces three new smartphones that use homemade operating systems 'Samsung bada'. All three are expected to increase market share and be an alternative in addition to their primary focus on Android. Like the previous Samsung bada phones series, they bear the name of the Wave. Samsung develops Bada to strengthen themselves in the field of software, after the previous focus as a hardware manufacturer. Samsung Wave 3 to be the most superior. 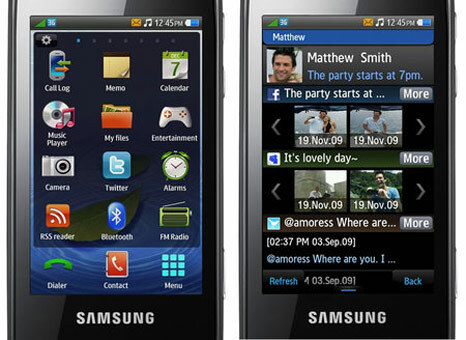 Wave 3 had a 1.4 GHz processor, 4-inch screen Super AMOLED technology and a 5 megapixel camera. The body was wrapped in metallic. While the class Wave M and Wave Y is below. Wave armed M 832MHz processor, 3.65-inch screen, and a 5 megapixel camera. Medium Wave Y has the same processor with Wave M, but the screen size is only 3.2 inch and 2-megapixel camera. Quoted by Reuters on Tuesday August 30, 2011, trio Samsung mobile phones over the previous 7 series add to the already present in the Wave family. Support the application can be obtained from Samsung Apps now has about 13 thousand applications. Wave Three handset that supports all ChatOn, messaging service from Samsung. ChatOn expected to compete with popular messaging services such as BBM (BlackBerry Messenger). Called the price or availability yet, but it seems in the near future.